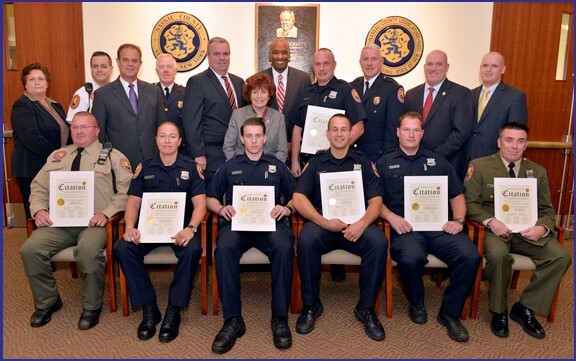 Presiding Officer Norma L. Gonsalves recently honored members of the Nassau County Police Department’s Third Precinct at a meeting of the Full Legislature held at the Theodore Roosevelt Executive and Legislative Building in Mineola. Both Police Officers and Paramedics were recognized for their acts of bravery and courage to help protect the residents of Nassau County. Pictured (l-r): Chief Steve Skrynecki; Acting Police Commissioner Tom Krumpter; Presiding Officer Norma Gonsalves; Minority Leader Kevan Abrahams; Sean McCarthy, 3rd Precinct Commanding Officer; James Carver, PBA President; and honorees from 3rd Precinct.